Is there life on other planets? How do scientists look for it? 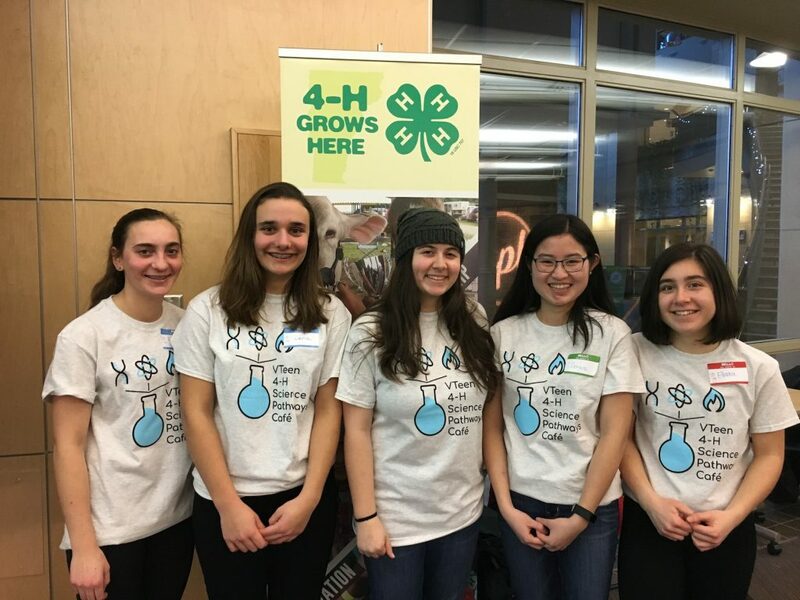 The VTeen 4-H Science Pathways Café welcomed Hillary Emick to share her expertise in Astrobiology for their inaugural café and Across the Fence was there to take video. Her graduate research for the NASA Astrobiology Institute at Arizona State University focused on the science behind the possibilities of life beyond our planet. 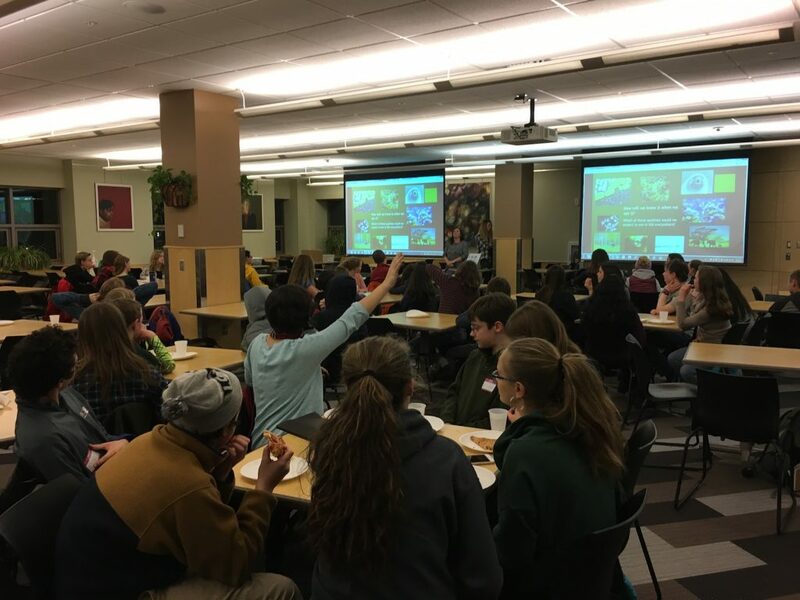 The café was engaging and teens could expand on previous knowledge from their classrooms, but in a more fun, informal way. 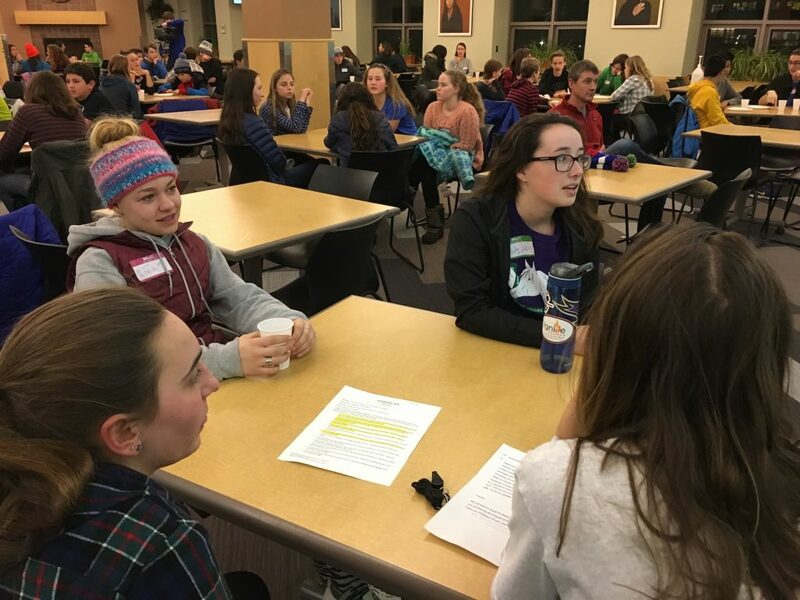 Before diving into the outer space aspect of the topic, Emick began with the question: “What is life?” From there, teens brainstormed the different characteristics of life. Together, they came up with: responding to the environment, reproduction, metabolism, evolution, having cells, purpose, and death. This was a great way to start the presentation because it gave the teens an idea of what scientists look for while discovering new species and possible habitable planets. Teens shared their thoughts and Emick explained how these characteristics correspond with her work. For example, other life forms will have some kind of information storage. Here on Earth, we have DNA. It will be similar, but not entirely the same once you’ve passed our atmosphere. Each slide in her presentation was more intriguing than the last. Teens learned about some of the 2000 exoplanets that have been discovered since 1992! As far as we know, there could be 40 billion Earth-sized planets orbiting stars similar to our Sun. She spoke of Enceladus and Europa, moons of Saturn and Jupiter, and how other countries have current missions regarding them both. The varying climates on Earth are very useful when it comes to researching other planets. We can find locations that have similar environments to space objects, like Hawaii to Mars, and Antarctica to different moons. Emick shared the studies going on miles under some lakes of Antarctica to measure plant life. The results of these tests are being used to gather more information needed for future space discoveries. The interactions between Emick and the teens were great. She asked them questions that they could answer based on prior knowledge, and some were too foreign to do so. But she broke them down to make them more relevant to the teens and they learned something new. Because the discussion could have gone on longer, we have expanded the time frame for our other cafés. Dr. Emick prepared a wonderful activity for the large crowd. (We had over 85 teens in attendance!) 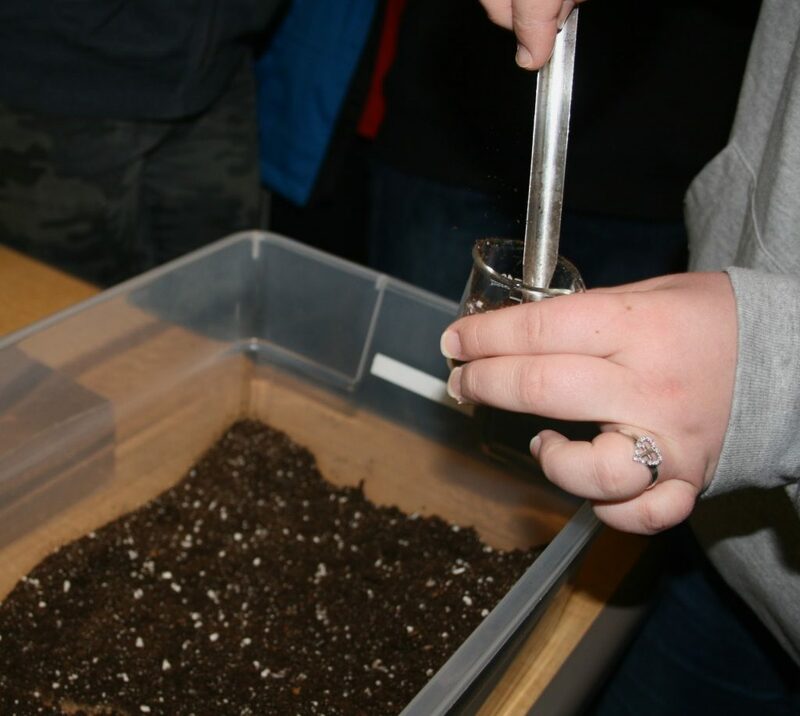 Teens learned how to recognize when carbon dioxide is present in soil by adding sugar water to different samples. She came in with tubs of soil and canisters of the water solution for the simple, yet informative experiment. 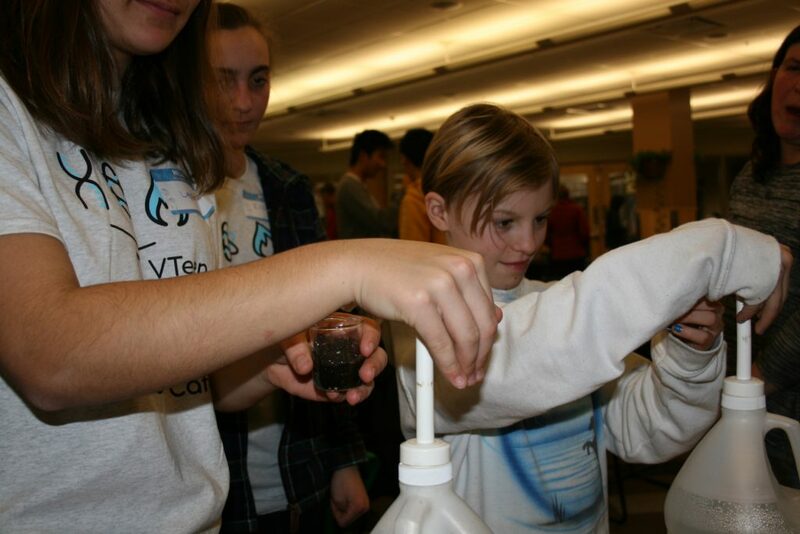 There were four soil samples, A, B, C, and D. Teens grabbed small beakers and filled them with a soil of their choice. After adding the sugar water to each of them, teens could see which samples reacted and formed bubbles near the rim. This was a more basic version of an experiment that the Viking Rover carried out on Mars in 1976 and scientists have argued about the results since! On Mars, there are carbonate materials in rock that react with water to create CO2. In our case, the purpose was to make the amount of carbon dioxide visible to the naked eye. Having a visual representation of this reaction was very interesting.